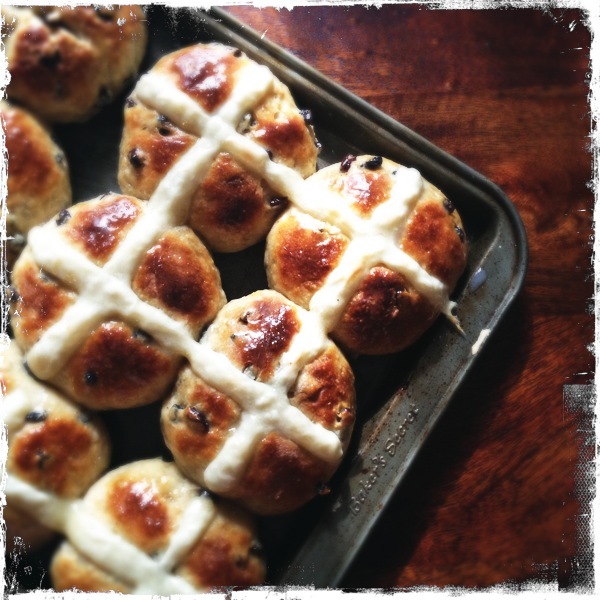 It’s Easter next weekend and for me you can keep the chocolate eggs and shower me with hot cross buns, the traditional way for Christians to break their Lenten fast. This recipe is so easy – it doesn’t even need any arm-numbing kneading – you’d be mad not to give it a go. I guarantee they’ll be better than anything you ever bought in a shop. Perhaps Britain has become a nation of Republicans or maybe the Brits just can’t resist a spiced bun, but hot cross buns, once only eaten over the Easter weekend, are now available in every supermarket all year round. Though a long way from being a royalist, I resolutely only make hot cross buns at Easter, enjoying the once-a-year treat and the Christian symbolism in my baking. The start of Lent is marked by using up all the rich ingredients (sugar, milk, eggs) in the kitchen to make pancakes on Shrove Tuesday. After 40 days of abstinence, people would celebrate by eating buns crammed with good things. The buns are made from a soft, yeasted, sweet and spiced dough and marked with a pastry cross to symbolize Christ on the cross. The first record of a bread marked with the sign of the cross is thought to be in the time of Pope Gregory IX when St Clare of Assisi blessed a stale loaf and a cross appeared on it. It is also thought that the spices in the bun represent the spices Jesus was wrapped in the tomb. There is nothing better (but only at Easter!) than a thickly buttered hot cross bun. They’re also lovely with a slice of mature cheddar—though I wonder what Good Queen Bess would have made of that. Grease a large baking tray. Gently heat the milk to lukewarm temperature, then beat in the eggs. In a large bowl, mix together the flour, yeast, salt, sugar and mixed spice. Add the butter and rub into the flour mixture until it looks like breadcrumbs. Stir in the currants. Make a well in the centre of the mixture and pour in the warm milk and eggs. Incorporate all the flour into the liquid until you have a coherent, soft dough. If the dough is too sticky, add a little more flour. On a floured work surface, knead the dough gently for 10 seconds, then put back in the bowl and leave for 10 minutes. Knead the dough again for 10 seconds, cover again and leave for about 1 hour (these timings are not a misprint—try it and see). When the dough has doubled in size, knock out the air and divide into 12 pieces. Knead each piece into a smooth ball. Put the buns on to the greased tray, place the tray in a large plastic bag and leave until the buns have again doubled in size. Heat the oven to 200 degrees Celsius. Mix the water and flour to make a stiff paste for the crosses. Put the paste into a piping bag and pipe on the crosses. Alternatively, and quite traditionally, you can simply cut a deep cross on top of the buns. In fact, although I love the aesthetics of the cross, I prefer the taste of the buns without the chewy pastry on top. Bake the buns for 15-20 minutes (see note 2). While the buns are baking, make the glaze by heating the milk and sugar until the sugar dissolves. As soon as the buns are a rich brown colour on top, take them out of the oven and immediately brush with the glaze. Eat the buns warm, buttered on the day they’re made. If there are any left the next day, they are beautiful toasted and buttered. • Note 2: Using an electric surface-top oven, I kept the top and bottom elements on for 10 minutes, then turned off the top element for the remaining 5-10 minutes. Karen, glacé cherries have no place in my buns! Hi Pamela, Have been following your blog for a while now and I simply love your posts. I am an Indian and live in England so your blogs brings the best of both worlds rather beautifully, from Aloo Poori in Old Delhi to Macarons from Pierre Herme’s. It was just this Easter that I wondered whether the cross on the Hot Cross Buns was symbolic and I know now!! Keep writing, loving it! I love hot cross buns. I have to try this recipe, maybe this weekend despite the heat! My surface-top oven only does top or bottom but it’s been acceptable for baking – I cannot live without biscuits and hot cross buns. Myfanwy – 🙂 I know what you mean – I never stop baking even in the 40 degree heat of Delhi summer! Pamela, I love this recipe. And I am going to try it. It seems so easy. And so yummy. I have been reading about the spice trade in some history books and I think for a time the Portuguese cornered the spice market and that may be why Queen Elizabeth I tried to control the amount of spices being used. The Portuguese really increased the price and perhaps she didn’t want to make them richer than they were. There are all kinds of interesting spice trade stories. For example, it was either the Spanish King or the Portuguese King way back when, I can’t remember which, who had a complete monopoly on black pepper. But at the time another kind of pepper with more popular, long pepper! Long pepper is a bit more peppery actually and is indeed LONG. But this king forbade the use of the long pepper and it soon fell out of fashion. I looked it up on the Internet and it is still available but only just. Interesting, huh! By the way, I don’t know why, but all of the photos from your MINT columns disappear on my iPad. For all the MINT column photos, even the one above. I can never see any of your MINT FOOD photos at all. There is just a blank box with the caption, I wonder why?